Becoming a successful entrepreneur takes energy and drive. Less than 20% make it beyond the first three years. Achieving the next level, the status of business titan -- the upper echelon of leadership -- takes an unrelenting commitment to turn an idea into a plan, a plan into a startup venture, and a venture into a successful business. The chances of getting to the top are slim at best, relying on a particular set of skills and attributes. 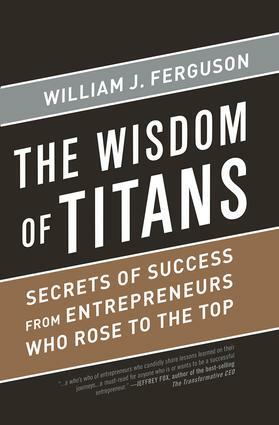 In The Wisdom of Titans, William Ferguson shares how 10 famous titans, from Bill Marriott to Julia Stewart, made it to the top, for every entrepreneur to learn from and follow. The book describes the challenges of leading service organizations, in particular, where managing and motivating thousands of people can make or break the business. The book provides advice for those just starting out as well as business leaders looking to take their enterprise to the next level.